Synthetic fiber net and wire net have some weak points, such as continual tears, rust, erosion, decline of strength, etc. Kikko Net has been developed to overcome such difficulties by knitting Tetron plastic wire with the original technology. 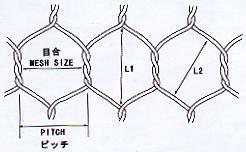 Lightweight - The specific gravity of Kikko Net is approximately 1/6 of iron wire net. This makes it easy to carry and set up. Strength - Continual tears do not occur because the structure is composed by a special knitting method. Anticorrosive - Kikko Net does not rust. Chemical resistance - is resistant to chemicals and sea water, highly resistant to acids. This makes Kikko Net ideal for usage in the sea, acid soil and any other situation requiring long standing results. Environmentally friendly - No harmful materials are included in the raw material. Kikko Net is nonconductive to electricity.